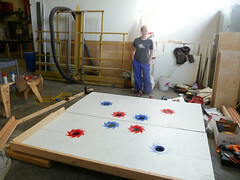 Kate helped me build the floating tilty game board for NotEphemerisle today. 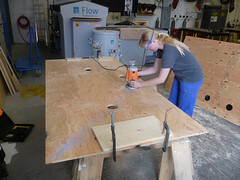 We learned that routers and hole saws are awesome. 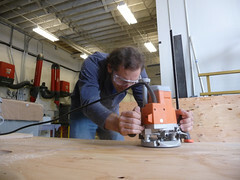 We're planning on testing it at Fortman Marina in Alameda on Monday. Come by if you want to play! What will it be like? Check out this scale-model video of gameplay from 2010. The project was originally planned for that year but abandoned in favor of the koosh.